A few years ago I met Salvador Banuelos. I was fortunate to find a promotional advertisement and noticed that his collection agency specialized in the freight transportation industry. I had a couple of bad experiences with lawyers and companies which I had assigned uncollectible accounts and unfortunately have not had any success in recovering that money. We gave up, and although the percentage of bad debts in a company is not always high, any amount represents a loss. It was not until I started working with AFS International that I finally saw favorable results. I remember clearly my first meeting with Salvador; I knew immediately that the success of AFS International was due to his comprehensive knowledge in this field. I finally found someone who spoke the same language, as he knows the terminology and legislation relating to the freight transportation industry and I soon realized his broad experience and expertise in the techniques and processes of credit and collection. His was the perfect combination of experience and knowledge. 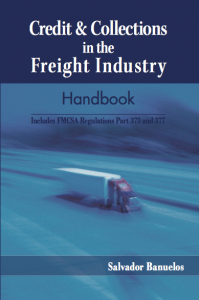 Later when Salvador related his idea of making a collection guide for the freight industry, I found it wonderful as I was sure it would be of great help for all the businesses involved. However, when I received a preliminary issue, upon reading it, I realized that it could not only help businesses in our industry but be a guide for many other companies as well. Even if this is focused on a particular industry, it contains advice and procedures which might apply in any other company, but specifically information that can be of great value for those who work in the area of credit and collection. Unfortunately, in many cases, the work in the credit and collection area is undervalued, and many people consider it an easy and logical process. By reading this book you will realize it is much more complex than it seems. But as you will see, Salvador has achieved his aim to simplify the process, in structuring the fundamental parts that all companies must analyze, while providing tools that are extremely important and which make a huge difference in the outcome of a business. I hope that his guide is only the first of many. Thanks to Credit & Collections in the Freight Industry Handbook, the area of credit and collection in your company will be one less concern and can now be considered as an ending point in the cycle of sale. Salvador Banuelos, CEO of AFS International, LLC.